The Clark Lake Loop trail is located in the La Sal Mountains near Moab, Utah. 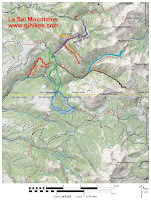 The loop is made by combining a section of the Clark Lake trail with the Clark Lake Loop trail and the Boren Mesa trail by beginning at Oowah Lake and climbing the Clark Lake trail on the north side of the gulch to Clark Lake. At the lake the loop begins following the Clark Lake Loop trail as it crosses the creek and returns toward Oowah Lake along the south side of the gulch. As the trail approaches Boren Mesa the Clark Lake Loop trail ends and the loop finishes up by following the Boren Mesa trail the rest of the way back to the campground. The Clark Lake trail itself continues on past Clark Lake extending all the way up to the Geyser Road. To get to the Oowah Campground drive south out of Moab on Highway 191, measuring 7.8 miles from the intersection of Center and Main, and turn left onto the Old Airport Road. The turnoff is marked by a sign for the La Sal Mtn. Loop Road. Follow the loop road for 12.3 miles and turn right at the sign for the Oowah Campground. Follow the now graveled road for about 3 miles to the campground. The Clark Lake Loop trail begins on the east side of the lake near the information kiosk. The trail starts out climbing immediately as it departs from the campground. After a short distance the trail passes through a fence. The trees transition from the dark forest of conifers around the campground to a mix of aspens which allow more sunlight to reach the ground enabling a thicker undergrowth of brush and wildflowers to flourish. The steeper parts of the trail have switchbacks to ease the climb. Several spots that get a little rocky but they soon transition back to dirt. The trail levels off somewhat after a little more than a half mile of climbing and comes to a trail sign that says 'Horse Gate'. This branch of the trail takes a more gradual approach to the lake and reconnects with the other routes when it gets there. After continuing on up the Clark Lake trail a little further you can look down and see where the horse gate branch passes through the fence and the Clark Lake Loop trail begins on the right. 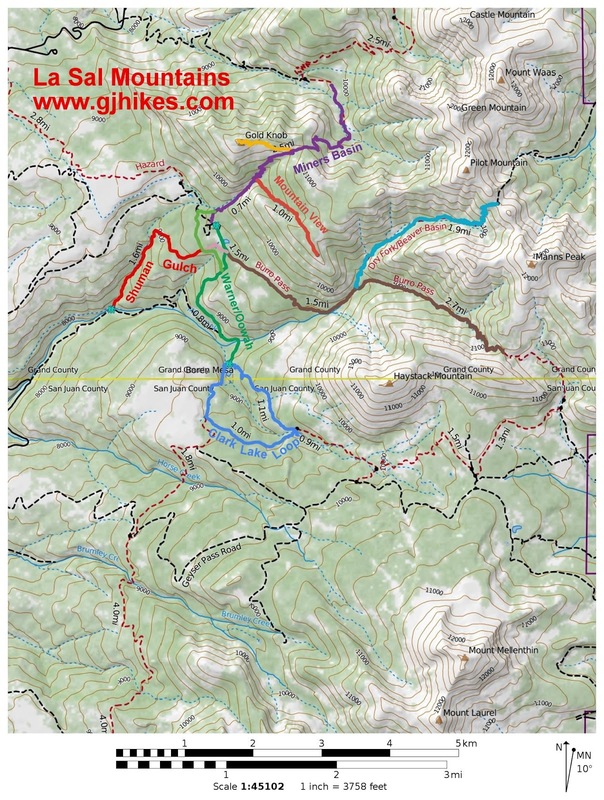 For those that elect not to take the horse gate branch there is a loosely packed trail that drops steeply down to the lake and to the beginning of the Clark Lake Loop trail. There wasn't anyone fishing at Clark Lake and there weren't any fish jumping while we were there so whether it gets stocked or not we can't say. The water looks deep enough that the lake probably doesn't winter kill so maybe it is hiding a lunker or two. From the lake the route turns back in the other direction to the horse gate and the beginning of the Clark Lake Loop trail. At the time that we were there near the beginning of July the area below the lake was flooded making the creek crossing much wider than it might otherwise be. The Clark Lake Loop trail is much nicer than the trail on the other side of the gulch. There are only a few rocks and the elevation changes are more gradual. The forest is thicker though and obstructs the view of the surrounding mountains. After more than a mile the Clark Lake Loop trail comes to an end and the route transitions to the Boren Mesa trail. The Boren Mesa trail isn't too bad as it starts out but it soon gets much rockier as it begins dropping elevation to get down to Oowah Lake. The descent is constant as it makes up for the lack of elevation change that the Clark Lake Loop section had. Towards the end of the Boren Mesa section of the loop there are some good views of Oowah Lake in the valley below. Eventually the trail reaches the level of the lake where it crosses the dam and the main loop comes to an end. The Clark Lake Loop is a good option for those staying at the Oowah Campground that would like to get some exercise when the fish aren't biting. If you would like to see it for yourself then all you have to do is grab your bike or 'Take a hike'.